Hydrangeas, that old-fashioned shrub, have made a comeback in a big way with renewed popularity and many exciting new cultivars on the market. Though not fragrant, the colors of white, pink, blue and lavender (depending on cultivar and aluminum availability) are refreshing and the essence of summer—blue as the skies, white as the clouds, or pink as roses. Make room in your garden for one or two of these beauties! 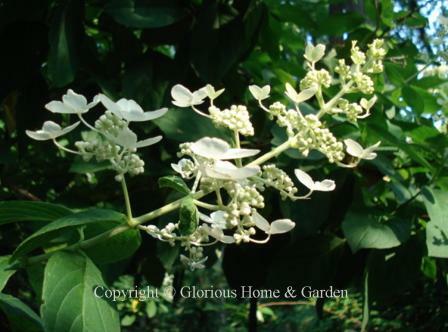 Hydrangea arborescens, smooth hydrangea, Zones 4-9. 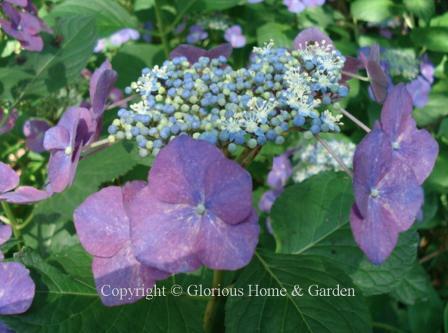 Smooth hydrangea is one of our most outstanding native shrubs. It is indigenous from southern New York south to Florida and west to Louisiana and Kansas and commonly found in moist woodlands and along streambeds. 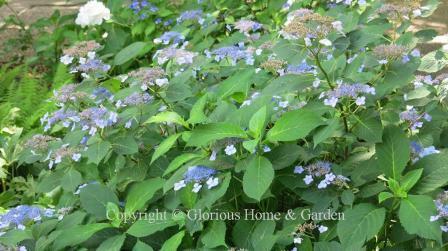 And like H. macrophylla and H. paniculata, it has both lacecap and mophead forms, but the mopheads are the better known. 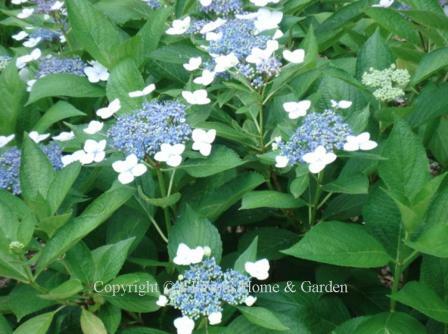 But unlike H. macrophylla, it can bloom on the season’s new growth, so there is more flexibility when it comes to pruning; and it is more cold hardy also. The flowerheads are predominately white, with a few pink cultivars available. 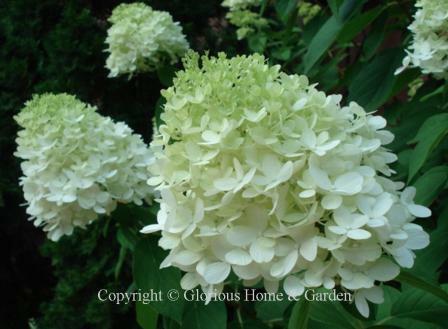 ‘Annabelle’ is the best known and most widely grown of the H. arborescens cultivars. 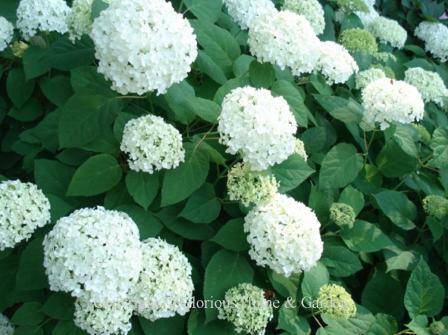 The flowerheads, or corymbs, opening green and matuing to white, are huge puffballs that tend to weigh down the stems. A mature plant in full bloom is spectacular—a grouping of them unforgettable. 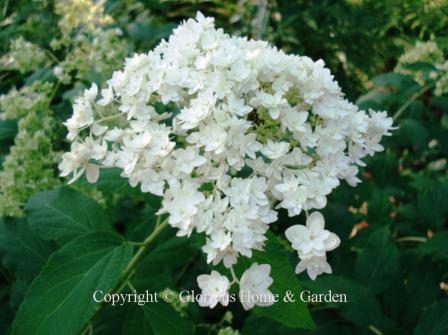 If you want a big white-flowered hydrangea, this it the one. Hayes Starburst’ is a lovely double flowered form. 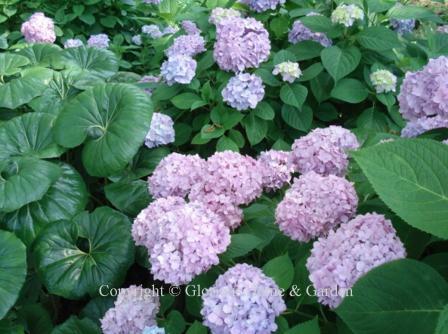 Hydrangea macrophylla, bigleaf or French hydrangea, Zones 6-9. 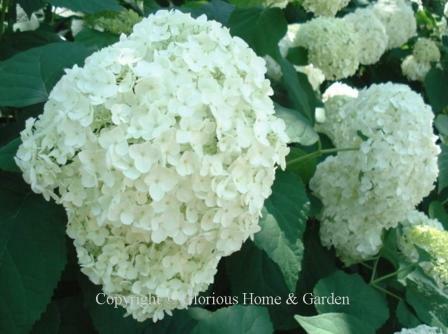 These are what most people think of when they picture hydrangeas, big puffy balls of white, blue, pink or lavender. They are quite tolerant of salty air and do very well on the seacoast. 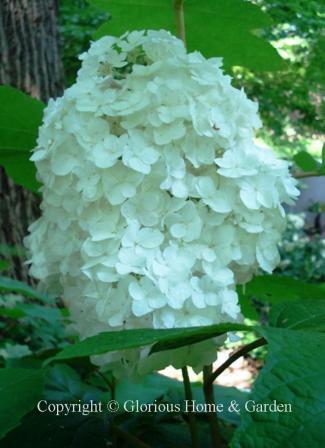 There are two big categories of H. macrophylla that look quite different--mopheads (also called hortensias) and lacecaps. 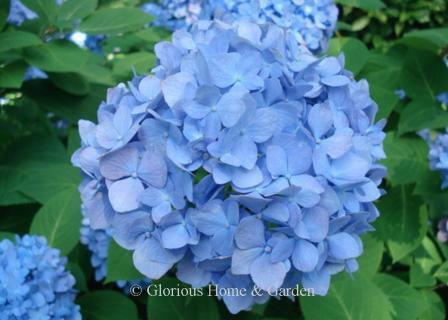 Best in shady or party shady locations, but grow extravagantly in full sun in coastal areas. 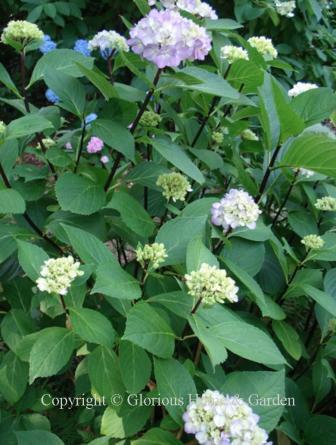 Part of the fun of growing these hydrangeas is the ability to change the flower color. Blue is determined by the availability of aluminum in acid (low pH) or alkaline (high pH) soils. Aluminum is more soluble (and thus more available to the plant) in acidic soils producing blue flowers. Aluminum is not as soluble in alkaline soils, resulting in pink flowers. 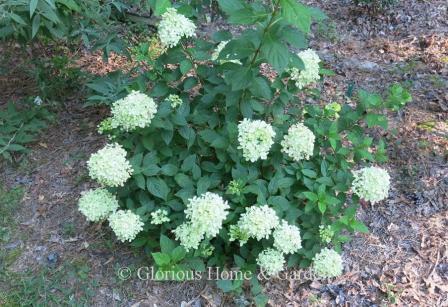 Having your soil tested for pH is a great way to learn how to treat your soil if you are serious about growing hydrangeas and want specific results. Base on the test results, if the soil is too alkaline you can add aluminum sulfate to lower the pH; and if the soil is too acidic and you prefer pink flowers, you can add lime to raise the pH. 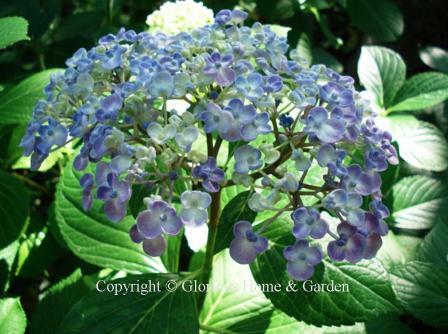 Pruning H. macrophylla: The important thing to remember about pruning these hydrangeas is that they bloom on new wood. They set the next year’s flower buds by the end of summer, so if you prune them in fall or winter (other than trimming off dead flower heads) you will lose your flowers for a year. The time prune them is after they bloom in mid-summer—probably no later than early August. Mopheads form balls of tightly packed florets, that are actually sepals. The true flowers are tiny and clustered in the center. 'Ayesha’ has in-curved cup-shaped sepals that give it a different appearance from other mopheads—it also has a slight fragrance. Zones 6-9. 'Mme. Emile Mouillère’ is a white mophead with pink or blue «eyes. » Zones 5-9. 'Nigra’ produces smaller flowerheads that are set off by dark purple stems. Zones 6-9. 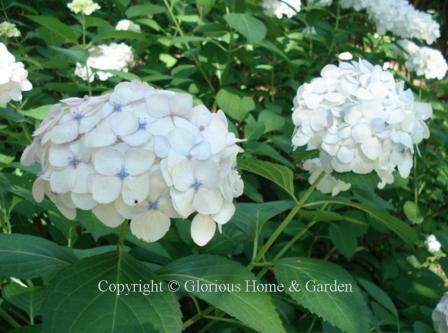 'Penny Mac’ is named for Penny McHenry, who founded the American Hydrangea Society. 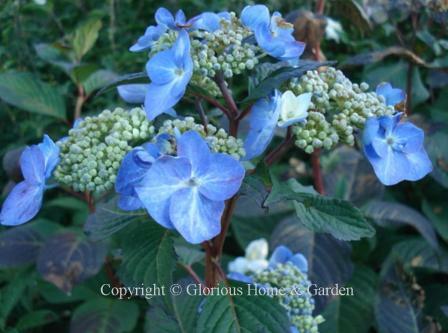 This classic H. macrophylla mophead is variably pink or blue depending on your soil chemistry. Zones 5-9. Lacecaps have a tight inner cluster of true flowers surrounded by the larger outer ray florets. As with the mopheads, the color is changeable depending on the aluminum availability in the soil. ‘Blue Wave,’ also known as ‘Mariesii Perfecta’ is an older lacecap cultivar, but very showy in the garden. Can be pink, lilac or blue depending on the availability of aluminum in the soil. Zones 5-9. 'Endless Summer® Twist-n- Shout®’ is a fantastic lacecap that reblooms all summer--in fact, this one was still blooming in October at the Coastal Maine Botanical Gardens! Blossom heads can be blue or pink depending on your soil. Zones 4-9. 'Sea Gull' (‘Mowe’) also known as ‘Geoffrey Chadbund’ is a Swiss cultivar with unusually large flowerheads that are very striking in the garden. Zones 6-9. ‘Fuji Waterfall’ is a delightful lacecap with double ray florets that open white maturing with a touch of blush or blue depending on soil pH. The blooms have long pinkish pedicels that arch over giving the waterfall effect. The central complete flowers are also double. Rich, dark green leaves set off the blooms beautifully. Also known as -Fuji -no-taki,' or 'Sumida-no-hanabi’ Zones 5-9. ‘Veitchii’ is a lacecap that is ringed with white ray florets. Zones 6-9. 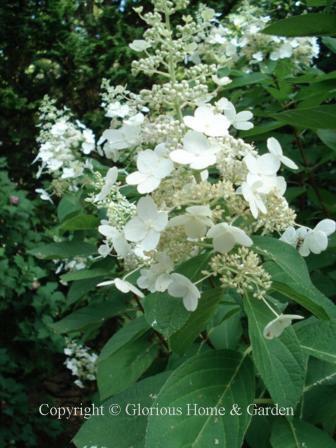 Hydrangea paniculata, or panicle hydrangea, extends the hydrangea season by blooming later in the summer after H. macrophylla, and it is also more cold tolerant. The flowerhead is an elongated panicle that often turns lovely shades of pink, rose or red as they mature. H. paniculata blooms on the current season’s growth, so it can be pruned in late winter to early spring without loss of bloom. 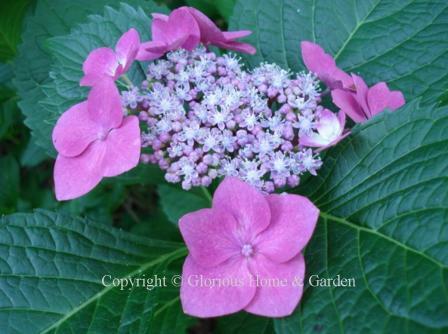 'Burgundy Lace’ opens white and ages to pink and then violet. Zones 3-9. Fire Light®’ is a lovely, fast-growing cultivar from Proven Winners that can reach 4 ½ to 6’ in height. The large white trusses of blooms appear all summer into fall and turn lovely shades of pink to raspberry-red as they mature (especially in cooler weather). Zones 3-8. 'Limelight’ is a very exciting cultivar that really skyrocketed the popularity of the paniculatas. Large upright panicles open lime green and mature to white and then to pink. Zones 4-8. Little Lime®’ is a more compact version of the popular ‘Limelight.’ It grows to a 3-5’ mound with flowers that open green, then white and mature to rosy tones in fall. Zones 3-8. 'Unique’ forms a tall shrub (to 10’ or more) or small tree with large inflorescences of white that age to pink. Zones 3-9. Hydrangea quercifolia, oakleaf hydrangea, Zones 5-9. 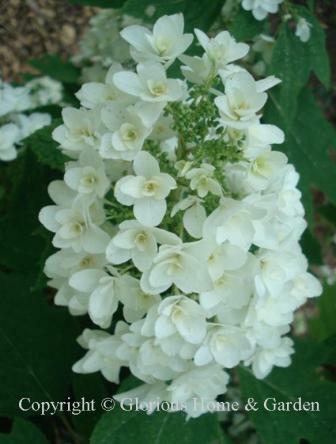 Oakleaf hydrangea is an outstanding native shrub that produces large, white showy inflorescences in summer that fade to pink and finally brown. The foliage, which resembles oak leaves, often turns deep red and burgundy colors in fall. 'Emerald Lake’ has denser flowerheads than the species. Zones 5-9. 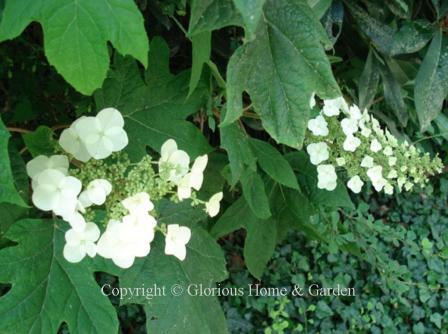 ‘Snowflake’ is a double-flowered oakleaf hydrangea—actually multiple layers of sepals, creating a wonderful garden effect. 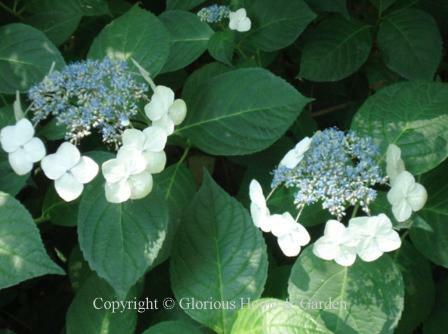 Hydrangea serrata, mountain hydrangea, is a species from Japan and Korea with a delicate, refined appearance on a smaller plant than H. macrophylla. In fact, experts consider H. serrata a subspecies of H. macrophylla as they share many of the same characteristics and requirements. There are both mophead and lacecap types, though lacecaps seem to predominate, they can be blue or pink depending on the soil pH, and they both bloom on new wood, so should not be pruned until after flowering. Regardless of their classification, they are lovely plants and suit some situations better than their larger cousins. 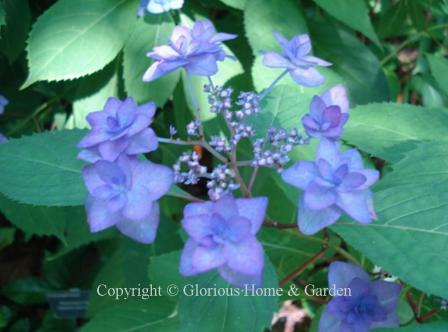 'Blue Deckle’ is a lacecap that reblooms in the late summer to early fall. Very hardy cultivar that blooms on new growth. Zones 6-9. 'Miyama-yae-murasaki’ is a lacecap type with double ray florets of lilac or blue encircling the central fertile flowers. Zones 6-9.